Today only a third of the world’s 177 large rivers (1,000 km and longer) remain free-flowing, unimpeded by dams or other barriers. The European otter, the Black stork and the White-finned gudgeon compete with each other on a special website. The deadline for voting is 22 May, the International Day of Biodiversity. For the last few years WWF has been working to restore the protected island and to re-vitalise its silted up side-arm which has been blocked by a cross-dam since the 1980s. These hydro-engineering works are WWF Hungary’s largest conservation project. 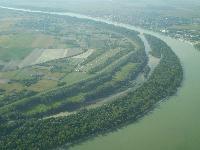 The aim is to bring back to life the natural floodplain forest of Liberty Island and the Danube side-arm. The works, which include dredging the sediment and the opening of the cross-dam, also help to secure drinking water for local communities. When the river ecosystem is restored by the end of 2013, it is hoped that many native fish and bird species will return to the area, near the city of Mohacs. The WWF project is supported by both EU LIFE+ funds and corporate partners like Coca-Cola. Hungarian celebrities support the “applications” of the European otter, the Black stork and the White-finned gudgeon in the competition – the model Fanni Weisz, the singer Janicsák Veca and the humorist Adam Kiss. Competition participants may also win prizes including photo cameras.